With wonderful black and white drawings by Helen Lang and another FREE ACTIVITY SHEET inside ! Paperback. £5.99 Post Free, signed by Susan Hill. £5 IF YOU ORDER BY THE END OF NOVEMBER. WIN THE CHANCE TO GET YOUR NAME IN A FUTURE BILLY-WILLIAM BIGHEART BOOK! SEND IN YOUR BILLY-WILLIAM BIGHEART pictures and drawings.. the best will be displayed here in a special gallery. 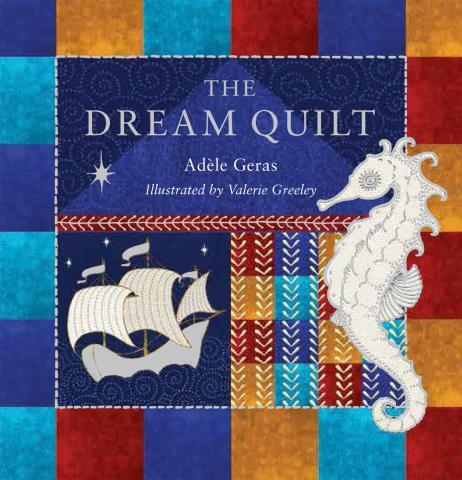 The Dream Quilt by Adele Geras, with full-colour Illustrations by Valerie Greeley. A beautiful simple story by one of our best-loved children's writers. A mother stitches the patches of a quilt into her child's dream, one by one. Small format hardback, perfect for Christmas stockings. A most beautiful book for young and old. £7.99 POST FREE. 6.99 IF YOU ORDER BY THE END OF NOVEMBER. Susan Hill started writing when she was five years old and has never stopped since. As well as her many books for adults, she wrote a number of children's stories to read to her daughters Jessica and Clemency when they were young. Now she has a granddaughter, Lila, she has started writing children's books again, starting with the Billy-William Bigheart series. Susan lives in North Norfolk not far from the sea. Designed by Josa Young and built by Interfinet.